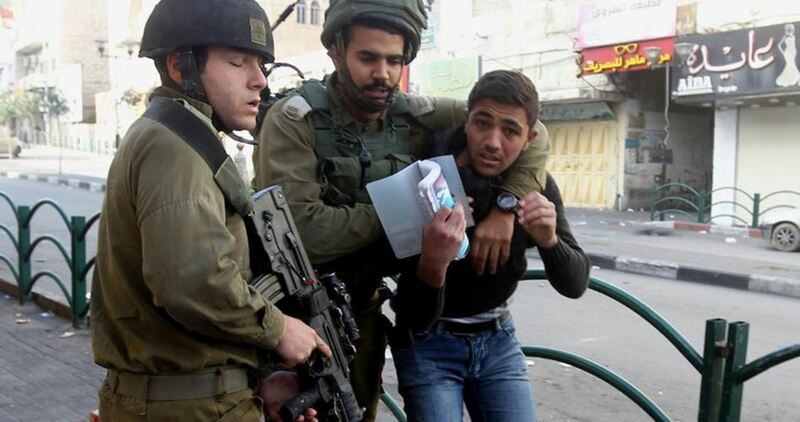 Dozens of Israeli soldiers invaded, on Thursday at dawn, the Deheishe refugee camp, south of Bethlehem, shot ten young men, and abducted one, in addition to abducting three Palestinians near Nablus, and two near Jenin. Media sources in Bethlehem said dozens of soldiers, and undercover officers, invaded the Deheishe refugee camp, and initiated violent searches of homes. They added that many youngsters hurled stones at the invading army jeeps, while the soldiers fired many live rounds, rubber-coated steel bullets and gas bombs, wounding ten Palestinians, including four with live fire. The Palestinians, who were shot with live fire, were rushed to Beit Jala Governmental hospital for treatment. The soldiers also invaded and violently searched many homes in the refugee camp, and abducted Ma’ali Issa Ma’ali, 34. 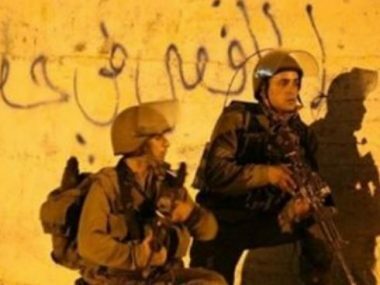 Furthermore, the soldiers invaded Siris village, south of the northern West Bank city of Jenin, searched homes, and abducted two Palestinians, identified as Taher Fawzi Qteit, 36, and Osama Ezzeddin Najm, 34. Also in Jenin, the soldiers invaded the villages and towns of Um at-Toot, az-Zababda and Methaloon, and installed many roadblocks in various parts of the governorate. Israeli soldiers resorted, Thursday, to the excessive use of force against the funeral of slain teen from Deir Nitham village, north of the central West Bank city of Ramallah, and seriously injured one Palestinian with live fire. 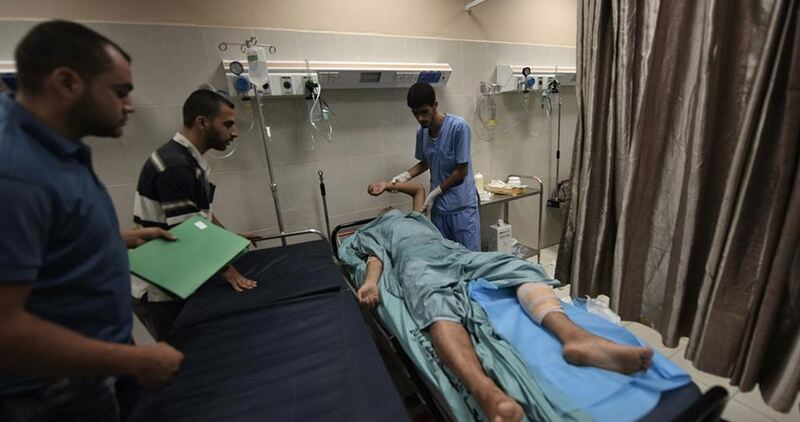 The Palestinian Health Ministry said the soldiers shot a young man with live fire, causing very serious wounds. It added that the seriously wounded young man was rushed to the Istishari Hospital in Ramallah, and was moved to surgery before being placed in the Intensive Care Unit. 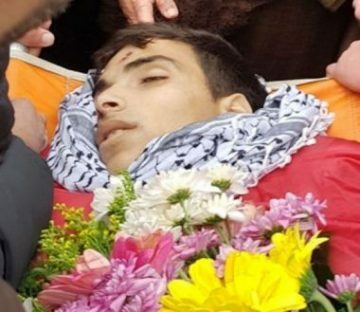 The young man was shot during the funeral procession and ceremony of Mos’ab Firas Tamimi, 17, who was killed by the soldiers, Wednesday, in Deir Nitham. The soldiers installed a military roadblock at the main entrance of Deir Nitham, and started firing gas bombs and concussion grenades at the funeral procession. Many youngsters then hurled stones at the soldiers, who fired more gas bombs, concussion grenades, rubber-coated steel bullets and rounds of live ammunition, causing many injuries, including the young man, who suffered life-threatening wounds. It is worth mentioning that the funeral procession started from the Palestine Medical Complex, in Ramallah city, where the slain teen’s body was transported by ambulance, followed by many Palestinians cars, heading to Deir Nitham. 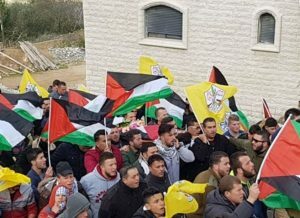 The soldiers stopped the ambulance and the cars, before local youngsters carried the Tamimi’s corpse and marched to the village while holding Palestinian flags, and chanting against the ongoing illegal Israeli occupation of Palestine. 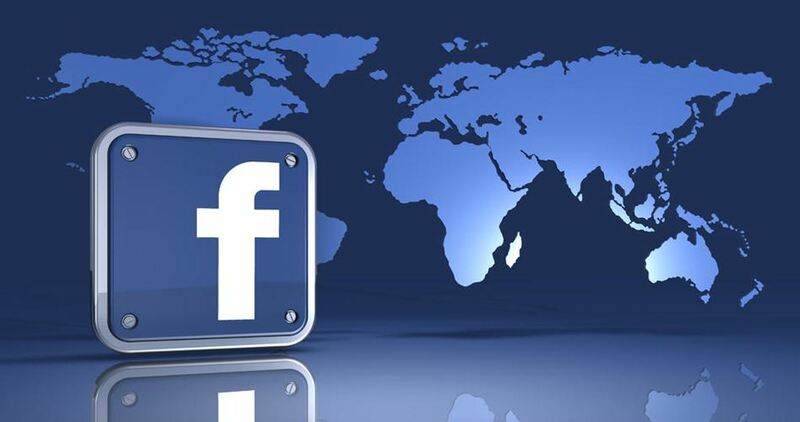 The Federation of Arab Journalists (FAJ) has strongly denounced the Facebook management for blocking accounts of Palestinian activists with no convincing reason. A Palestinian youth on Thursday afternoon was seriously wounded by Israeli Occupation Forces (IOF) who shot him with a live bullet in the head during clashes that erupted in Deir Nitham town west of Ramallah after the funeral of the Palestinian martyr Musab al-Tamimi. The injured Palestinian man was transferred to hospital as his injury was described as serious. The head of the local council of Deir Nitham, Ahmad al-Tamimi, told WAFA news agency that IOF soldiers blocked the funeral of martyr al-Tamimi, assaulted the participants and showered them with tear gas canisters and stun grenades. 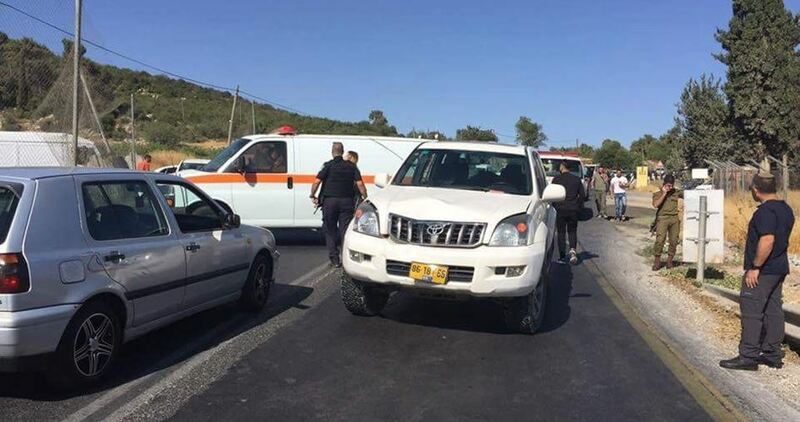 A 38-year-old Palestinian man, Rami Asad, was killed on Thursday after an Israeli settler, in a speedy bus, ran over him on Street 60, a bypass road near al-Khader town, south of Bethlehem city in the southern West Bank. According to the family, an Israeli bus driver deliberately ran over their son while he was going to work in his land. His brain was scattered over the road and he died immediately. The family added that Israeli occupation authorities returned the body of the martyr to his family after five hours of the crime. 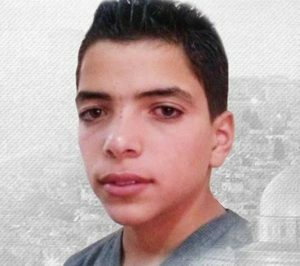 He was transferred to Beit Jala Hospital in Bethlehem. The funeral is slated to be held on Friday afternoon in his town, Artas, which is located to the south of the city. Russia has expanded its military operations in Damascus and its suburbs as well as in Idlib province, resulting in dozens of civilian deaths and knocking a hospital in rural Idlib out of service. Local news networks said that airstrikes by the Assad regime killed 18 people in the town of Misraba and six others in the town of Irbeen in eastern Ghouta on Wednesday. Two children and a woman were killed in similar attacks on the town of Beit Sawa in eastern Ghouta. Regime forces also bombed the towns of Ayn Tarma, Hazza and Otaya in eastern Ghouta, injuring more than 15 civilians. Activists in Idlib province said that Russian jets continue to carry out airstrikes in the province. They said that the airstrikes killed at least eight people and destroyed large parts of a hospital in the town of Ma’arat al-Nu’man and a bakery in the town of Saraqib, putting them out of service. The Syrian Coalition condemned the continued airstrikes and artillery shelling on southern rural Idlib by regime forces and their allied Iranian militias and the Russian occupation warplanes. “The bombing campaign in Idlib, now in its third week, continues to target civilians and commit war crimes in violation of all agreements reached in Syria,” said the Coalition in a press release issued on Thursday. Israeli air strikes targeted a site in the Gaza Strip overnight in response to rocket fire from the Palestinian enclave, with no injuries reported, the military and Gazan security sources said on Thursday. The sources in Gaza said empty land was targeted east of the city of Rafah in the southern Gaza Strip, causing no injuries. The statement did not provide further details on what was hit. Palestinian militants in Gaza have fired at least 20 rockets or mortar rounds at Israel since US President Donald Trump’s controversial December 6 recognition of Jerusalem as the country’s capital, at least six of which have been intercepted by the Iron Dome defense system. No Israelis have been wounded by the rocket fire. Euro-Med Observer for Human Rights has said that Gaza Strip “is currently unviable place for human life” due to continuous Israeli siege and punitive measures of Palestinian Authority (PA). Meanwhile, the report said that the “continuous power cut, which extend to 20 hours a day, led to the suspension of normal life,” noting this puts the life of patients in Gaza hospitals at stake. Adding to this, the report said that thousands of students and patients are trapped in Gaza due to the closure of border crossings through Israel and Egypt. Therefore, hundreds of students have lost their places at international universities and patients died due to losing chances of proper treatment abroad. The Euro-Med said that 97 per cent of Gaza water is unfit for human consumption. Sewage and water networks in Gaza are under the threat of a sudden major collapse due to critical need for spare parts banned by Israel. In the light of the given details about Gaza, the Euro-Med called for the UN Under-Secretary-General for Humanitarian Affairs Mark Lokoc, the High Commissioner-General of UNRWA Pierre Krähenbühl and other international officials to hold an urgent conference to propose urgent solutions for the Gaza crisis. “A UN report previously indicated that Gaza would not be a viable place for human life by 2020, but the reality shows that Gaza is currently unliveable,” the Euro-Med stressed. Justice Minister Ayelet Shaked vowed Wednesday that Israel would remain in the occupied West Bank for “5,000 years”, speaking during a Knesset debate on applying Israeli legislation to settlers. The Knesset House Committee decided that from now on, “legislative committees will be instructed to discuss each new bill’s application to the West Bank”. Israeli laws currently normally require a military order to apply in the West Bank, since the region is governed by the army. “We’re not in Judea and Samaria [the West Bank] in order to disappear one day”, Shaked said. “We’re here for 50 years already, and we will be here for another 5,000 years. Our policy is clear: Settlement in the entire Land of Israel and normalization of life in Judea and Samaria”. Shaked’s coalition colleague, Tourism Minster Yariv Levin, expressed his support for the annexation of the occupied West Bank, stating that “the right thing to do is to apply our sovereignty on all parts of the Land of Israel, and I`m certain that this will be done soon”. Read: Who is responsible for annexing the West Bank to Israel? Meretz MK Tamar Zandberg said the Knesset was legislating for an apartheid situation. “There is a territory that is outside of Israel’s borders, and what you’re suggesting is to have two parallel legal systems in the same land, where the only measure that determines which system applies to whom is a person’s race. This has a name, and you know what it is,” she said.